The story takes place at well researched locations. It is about the nine year old German girl Hulda and her father Holger who are travelling by ferry to Iceland. The main settings of the story are in the East and the North of Iceland: Lagarfljót, Borgarfjörður eystri, Hróarstunga, Mývatn and some places in the Skagafjord. The last chapter is once again situated on the ferry. From Hulda‘s point of view the reader is introduced to some aspects of Iceland, its nature, animals, people, history and local folk tales. But the reader also follows Hulda‘s night-time adventures in the fantastic world of elves and trolls. On a campsite at Egilsstaðir an ugly huge guy is kidnapping Hulda. But he is not a man, he is the troll lad Fjöri, not much older than Hulda (in human calculation of times). He has the shape of a troll but his character is more elvish. 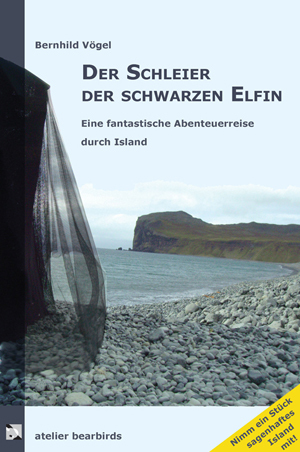 Over one hundred years ago an elf girl from Álfaborg found the little troll more dead than alive in the area of the Dyrfjöll and brought him up secretly. This elf was the great great grandmother of Hulda and was also called Hulda. When the other elves found out that the girl helped a troll, they excluded her from their community. Elf Hulda was forced to go into the human world, but it was a change for the worse and she became unhappy. Her daughter couldn’t bear the elvish sadness and followed a man to Germany. The connection to Iceland broke down, but it became a family tradition to give daughters Icelandic names. Fjöri becomes the friend and personal companion of Hulda, and by and by he tells her the story of her ancestress and of himself. But there is much trouble around their night-time excursions. It seems that a vindictive elf woman is pursuing them. And there is Holger, who must not find out anything about his daughter’s meetings with a troll. Hulda gets caught up in lies, has a bad conscience to her father and is worried about Fjöri. Fjöri is the only living being from the world of trolls. Other legendary and fantastic figures are bound to the elements, they are part of nature, they appear in dreams or they are told about. In the end Hulda has to take leave of Fjöri. But she will take home a treasure: The love to Iceland, the land which at first seemed to be so strange and deserted, and fjör, the vitality, to overcome the dead hand of the elvish sadness. The cover shows an installation of Marek Ranis. The Polish artist who lives in the USA built it during a workshop in Baer Art Center near Hofsós / Iceland in summer 2007. The story is written with young readers in mind but it’s also a thrilling adventure story for grown-ups. It is suitable as travel reading, as a guide to some hidden sights, as well as a present. For easier reading there are no Icelandic place names in the text. They are itemized in a short appendix where the interested reader may also find some additional informations about points of interest, backgrounds and literature.